Boys who grow up in poverty in the US are less likely to be employed in adulthood than girls from equally disadvantaged backgrounds, according to new research from a team of Harvard and Stanford economists. This finding contradicts the norm in the US, where men, on average, are more likely to be employed than women. This study is part of an ambitious effort to use big data to look at how a child’s environment affects his or her likelihood of rising out of poverty called the Equality of Opportunity project . To determine the effect that childhood poverty has on the employment rates of adult men and women, the researchers looked at tax records for approximately 10 million Americans born in the early ‘80s. 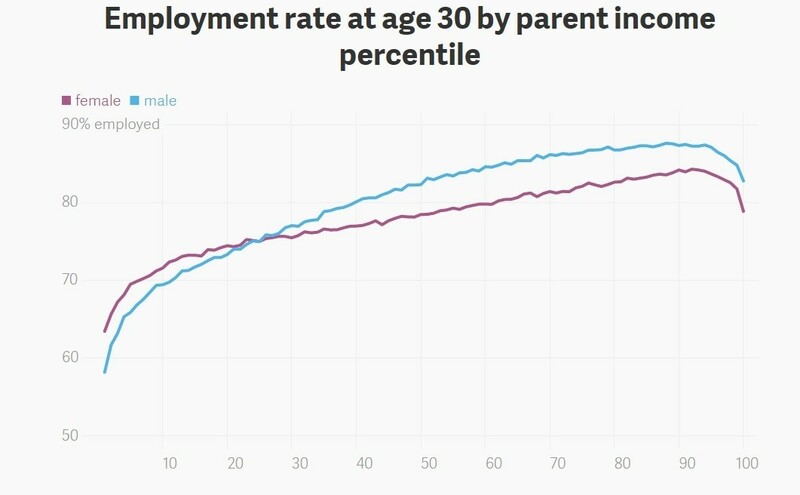 They found that for those who grew up in the poorest fifth of US households, far more women than men were employed by age 30. Whether their parents were together or not also had an effect on adult employment rates: Boys who grew up in single-parent households were less likely to be employed at age 30 than boys who grew up in two-parent families, no matter what their income level. 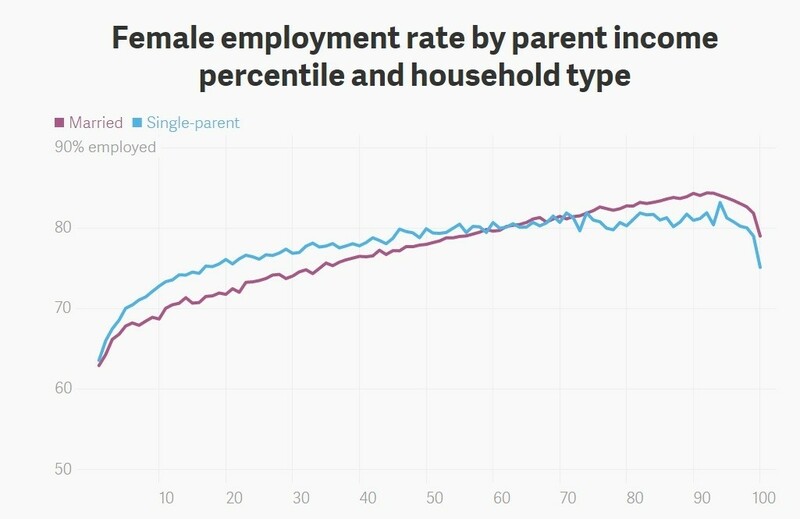 Girls who grew up with just one parent, on the other hand, were actually slightly more likely to be employed at age 30, the researchers found, up until the 60th family income percentile. At higher wealth levels, girls from two-parent families were more likely to be employed. Where children grew up also seems to bear on their employment as adults, although background factors like family structure, income-level, and neighborhood are clearly intertwined. When researchers looked at the data by a geographic measure called “commuter zones”, which are determined from census data about where people live and work, they found that this reverse employment gender gap tended to be more pronounced in commuter zones that have a larger fraction of black residents. These areas also tended to exhibit greater income segregation, a measure of the extent to which low-income households are isolated from middle- and upper-income households. One explanation the researchers offer for their finding is that growing up in areas of concentrated poverty may cause boys to take up illegal activities in place of formal employment. Using data on crime rates from the FBI, the researchers found that the commuter zones with higher levels of income segregation also had higher rates of crime. These findings have important implications. Male participation in the labor force in the US has been falling since 1972, and this trend has sped up in recent years. Female participation has also fallen since 2000, but at a lower rate. Meanwhile, income segregation has grown substantially from 1970 to 2000. Experts have attributed the decline in the male employment rate to an array of factors, including the effects of globalization, the disappearing power of labor unions, and the fast pace of technological change, all of which may be contributing to the disappearance of historically male-dominated jobs. 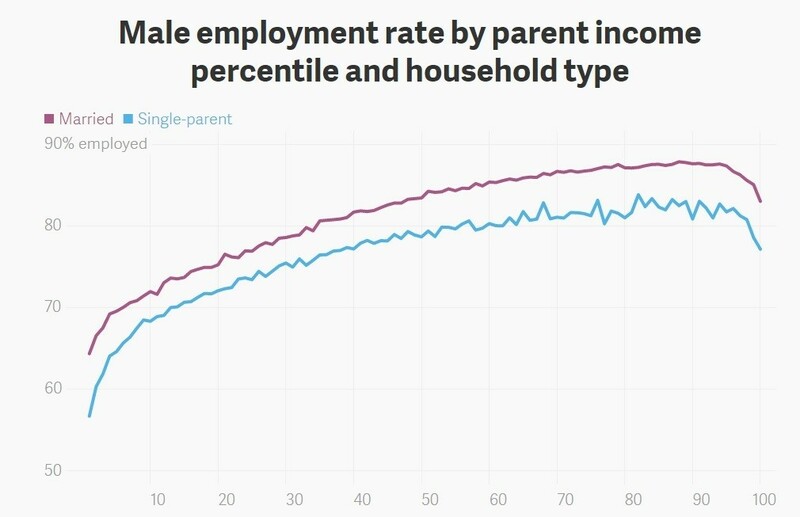 While some of these changes are impossible to reverse, this study shows that there is one demographic the US can focus on to have the greatest impact in putting men back to work.